“Had a meaningful consultative process been engaged to find a solution which meets the concerns of the majority, the present legal action might not have been necessary,” thus exonerating the head of the CWB, Allen Oberg, whose decision it was to take the Minister to court. Campbell argued in his ruling that Ritz demonstrated “disregard for the rule of law” in moving forward to dismantle the Canadian Wheat Board without first holding a farmer plebiscite, as stipulated in their founding document. What’s more, the CWB held its own plebiscite independent of the government to gauge the level of interest in moving towards a free market system for selling grain. 62 per cent of farmers voted to keep the board in place as it stands with regards to wheat, while 51 per cent voted in favour of keeping the board’s regulations over barley. 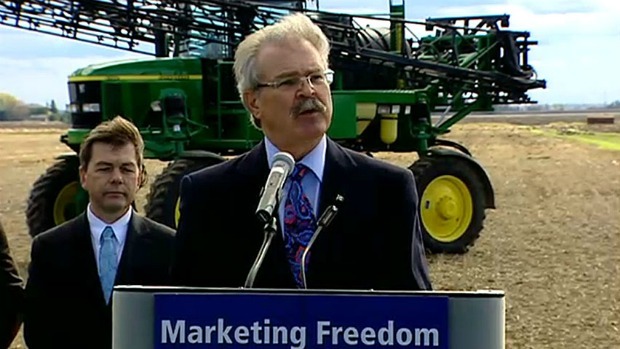 Oberg told the Winnipeg Free Press that the board “call[s] on Minister Ritz to comply with the spirit of this ruling and immediately cease actions that would strip away Prairie farmers’ single-desk marketing system without first allowing a vote by affected producers.” Oberg is currently in Ottawa where he is preparing to address a Senate committee meeting later this week to ask senators to halt passage of Bill C-18. It is unknown whether this will now be necessary. “The minister now needs to do the right thing, obey the law and hold a vote – as he should have done from the beginning,” Oberg argued. Ritz has long maintained that the government has no obligation to conduct a plebiscite on the matter because the Conservatives hold a majority of seats not only in the House of Commons, but in the area of Canada under Wheat Board control – 52 of 57 seats, to be precise. The embattled Minister rose in the House of Commons after 3:00 this afternoon to indicate that the government would be appealing the decision that the Conservatives “categorically disagree with.” Their basis for the appeal is that government “has the right to introduce or amend legislation,” according to the Minister, which grants the Conservatives the right to amend the CWB legislation to dismantle it. It is unclear at this point whether the government will halt the legislation currently sitting in the Senate of its own accord while they appeal the decision, or let the bill continue its way towards final passage, although it appears as if they will appeal while allowing C-18 to move through the Senate. What is also unclear at this time is how the government will hold Ritz accountable to the law as Judge Campbell’s ruling argues he must. If Allen Oberg was so convinced that Ritz and the Conservatives were overstepping their bounds, why did he only seek a ruling against Ritz instead of trying for a ruling to stop the process altogether. The government of the day has the ability and the right to change legislation from previous governments. How else can society change to reflect new ideals and improve or discard old legislation that is no longer appropriate or applicable. Oberg has never represented my views and never will. It is because of how the CWB has structured its list of members (it calls them all producers, even though the number is much greater than the number of farmers listed with the CRA) that they feel confident with the results of their plebiscite. Many of the actual farmers boycotted the vote because the end result will always be skewed due to 4X the actual numbers of ballots being distributed. All I want is the CWB to give me the money that it is holding on my behalf before it spends it all and then to get out of the way of progress. I wish that as a producer I had the money to advertise for the demise of the mandatory pooling system and the CWB in Western Canada. Oh ya, I would have had the money except the CWB spent it to advertise for its interests, not mine.